It was an amazing night on October 30 at the Power Arts Center for both professors and students. 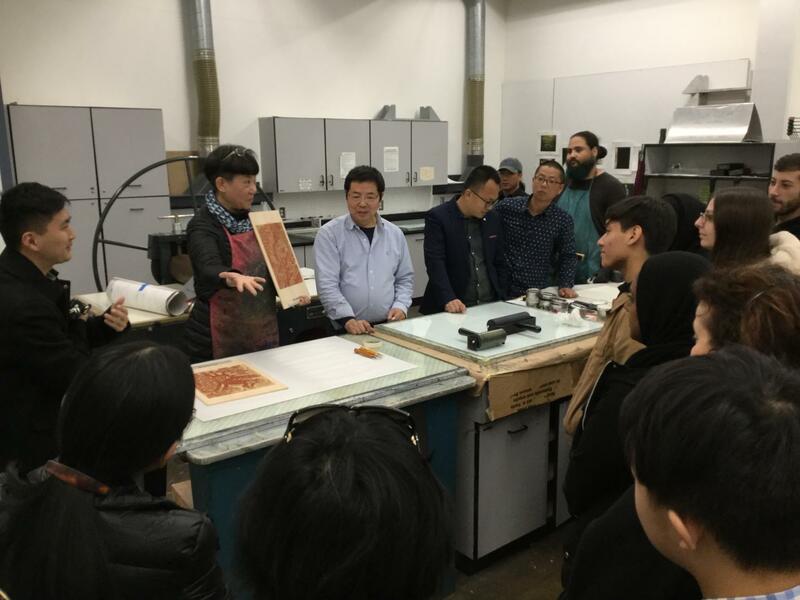 Not only was there a reception for the exceptional artist Lijun Xiong, but leading artists from China that specialize in printmaking visited Professor Zhiyuan Cong’s printmaking class and gave a presentation on the evolution of printmaking in China. The presentation covered the progression of the works from prints that date back many centuries to the current leading printmakers of China. That was just the beginning of what came to follow. These gifted and professional printmakers gave the class and visitors a demonstration on how woodblock printmaking is done. This included how to perform different techniques and steps to make them, which prepared the students to make their own woodblock prints. Students were provided with all the tools necessary to make these prints. Each student worked with their own original artwork. The students transferred their images onto the woodblock and, with special carving utensils, made the necessary cuts and grooves on the wood in preparation to apply ink on the carvings. The results were beautiful and successful. It was an amazing feeling being in the room with so many artists sharing and creating their art for all to see. Professor Cong looked delighted at seeing his basic printmaking class learn from masters in this field of art. Professor Cong himself is a renowned artist and even appeared on the cover of the September 20 “Wayne Today” newspaper issue. He talked about creating the masterpiece “Song Of the Phoenix: Paper Money Delivered to the West,” which took five years to complete. This piece of artwork, measured at 8 feet by 17 feet, has qualified to be a possible permanent display at the National Art Museum of China. 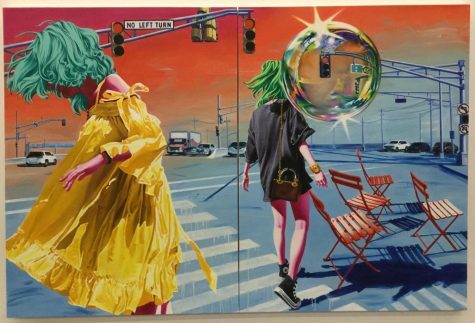 Painter Xiong Lijun’s reception down the hall in the Power Art Gallery, “Drifting Fragments,” exhibited her incredible oil paintings. Her paintings are so vibrant and beautifully made that one can’t help but to fall in love with their colors and imagery. Lijun’s paintings draw one into a world of beauty and fantasy. Lijun graduated from the Oil Painting Department of Sichuan Fine Arts Institute with a master’s degree in 2002 and became a teacher at the institute that same year. She is currently an associate professor, postgraduate tutor and director of the teaching and researching section there. The following week, Lijun gave a presentation of the art progression in China from the 1980s to the present. She spoke on taking images of her own life and working with them in her paintings. She has a great interest in painting her child, and teaches her students to promote their personality in their artwork. She quoted the phrase, “God is in the detail,” which means that any action or plan one undertakes should be done carefully and pragmatically. All in all, it was a very exciting and productive night filled with art, food, laughter and learning. The atmosphere was lively and everybody had a smile on their face. It was a great experience to learn and see first-hand how these professional masters of printmaking make their art and teach the younger generation how to do it.